While there is some evidence that phytic acid and oxalic acid in beans and greens can hinder calcium absorption, green vegetables and beans are still a good source of calcium, and the calculated daily value (DV) already takes into account absorption and bio-availability. (4,5,6) For more info, see the section on calcium absorption. 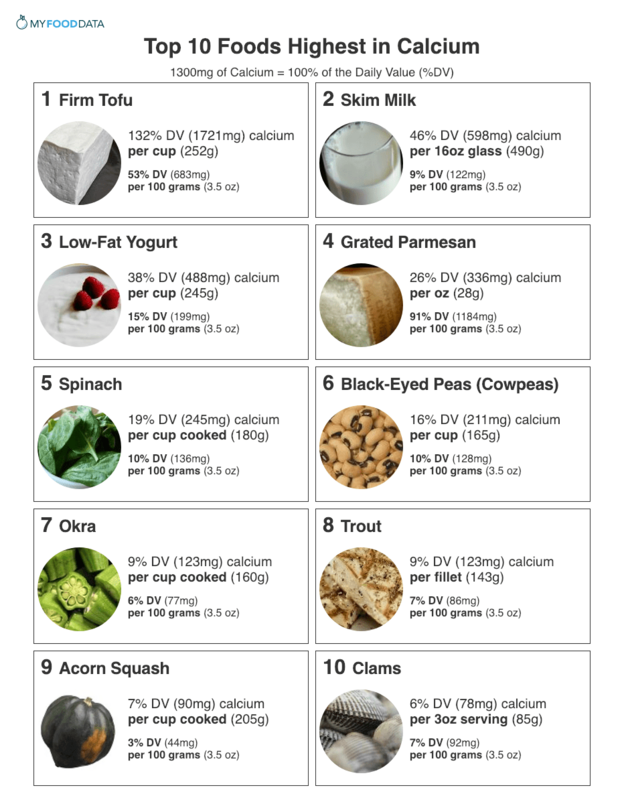 Below is a list of high calcium foods by a common serving size, for more see the nutrient ranking of over 200 foods high in calcium. Also see the lists of high calcium vegetables, and high calcium fruits. Only tofu prepared with calcium sulfate is high in calcium. Check ingredient labels. Whole Milk and 2% Milk provide 45-47% DV per 16oz glass. Fortified Soymilk also provides up to 46% DV per 16oz glass. See all dairy foods high in calcium. Note: Some claim that oxalates in leafy green vegetables harm calcium absorption. Studies on the effect of oxalates are mixed. (4,5,6) In general, leafy greens as part of a balanced diet are a good source of calcium. See the list of high calcium vegetables. See all beans high in calcium. See the list of vegetables high in calcium. See all fish high in calcium. Lower Blood Pressure (*Controversial) - There is mixed evidence if increased intake of calcium will lower or raise blood pressure. (8, 9) Several studies report that those who obtain calcium from plant sources are likely to have lower blood pressure and reduced risk of heart disease. (10) Conversely, those who predominantly consume their calcium from salty cheeses are more likely to have higher blood pressure and increased risk of heart disease. Individuals with lactose intolerance - People with lactose intolerance consume fewer dairy products, which in turn, can reduce the amount of calcium consumed. Vegetarians and Vegans (*Controversial) - Oxalic and phytic acids found primarily in plant products are thought to reduce absorption of calcium. (1)However, consumption of meats has also been shown to increase the excretion of calcium. (1) As such vegetarians and vegans might not be any worse off than omnivores, but should still be sure to eat plenty of plant foods high in calcium. Effects of fiber, phytic acid, and oxalic acid in the diet on mineral bioavailability. Dietary calcium and blood pressure: a meta-analysis of randomized clinical trials.